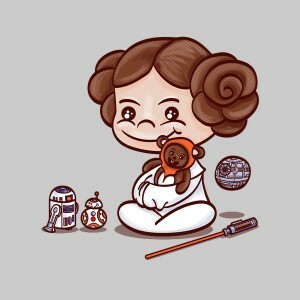 We are getting a huge influx of awesome female role models lately, but Leia was the original awesome woman. And now she has even more toys to play with since the new Star Wars movies. Look at that cute little BB-8! I bet it’s a Sphero one. This would be a perfect T-shirt to give your little daughter who is obsessed with the General and all she stands for. Hope, rebellion, strength. Or you could wrap this cloth around your torso to remind yourself that everyone needs a good female role model. Put some buns on your daughter’s head. Or your own head. Whatever. Be like Leia.